The current Session is hosted by Alec Latham whose excellent blog can be read here, don’t miss it including for Alec’s striking use of language. He has asked us to give an example of a beer or beer style that challenged our comfort zone and describe the outcome, not necessarily a binary of shun or shout-out, but taking in the intermediate. I’ll give two examples, both illustrative I think of the relative nature of taste and consumer choice. Since my early years drinking beer were prior to the onset of craft brews, my palate was adjusted to 5% abv beer. That was the commercial norm in Canada including for the few imports we had. 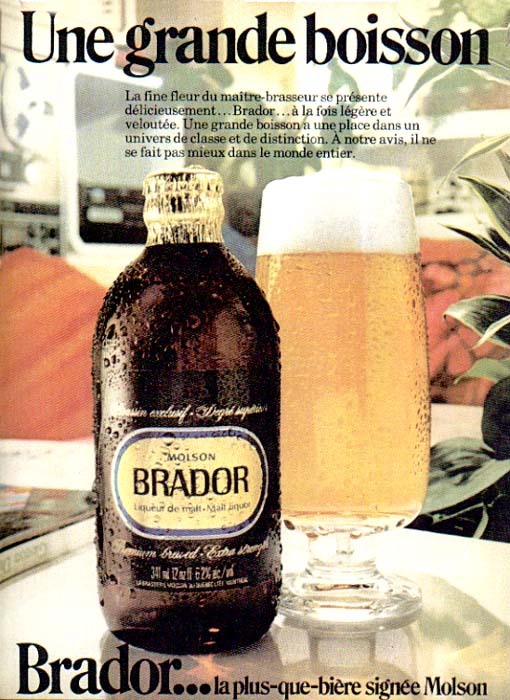 The only “strong” beer available in the later 70s in Quebec province, my birthplace, was Brador, at 6.2%. This was something rarely consumed due to its higher strength, it was regarded as something for a special occasion, not a go-to. It was also hard to find, relatively. The car trips down to Plattsburgh, NY did produce a wider range, but as American adjunct lager was mostly available, we were still in the c. 5% area. The odd Belgian or English import exceeded 5% but it was hard to tell since alcohol percentage was often not stated on the label. Anyway these were occasional, specialty items. I actually recall having early craft beers higher than 5%, and not liking them in the sense they seemed to have a different effect on me. I didn’t like the more “heady” feel of the stronger beer. It took years for me to broach them regularly especially on a weekday. So I did get to like them although I still always want to know what I’m taking in and how strong. It shows the relativity of the beer experience, what one is used to is the norm, and it takes time to break the mould. The other example I’d give, with the result of take-or-leave, is the American hop taste. Starting about 1983 my wife and I travelled regularly to the U.K. and the taste of pale ale and cask bitter became encoded, in part I think because the English hops at the base were so good. The best of these beers were the apotheosis IMO including Old Hooky, Courage Director’s and Best Bitter, Fuller ESB, Young’s Special, Old Peculier, but also many others. Bottled Guinness, too, and Courage Imperial Russian Stout. When American Cascade hop-based beers became regularly available in the later 80s-90s, it was a shock to the palate, so different was the grapefruit-and-white pith taste. It took me years to come to terms with it and now I like it when it is particularly well done. (I find addition of Amarillo helps a lot with its Seville orange signature). But to this day the first taste, even of a “good” one, is somewhat off-putting: in this sense I never left the comfort zone, defined for me by the top-end of English bitter. Is the English taste the best, based as it was on the local hop yards, fruity English yeasts, and two-row malts? Or is it just a matter of time, place, and habit? I’d say the former, on purely gastronomic grounds. The fact that so many English have cottoned to the American taste suggests perhaps I’m wrong. Or maybe they are. My God…Molson Brador. It has been years since I’ve even thought of it, but during the late 70s and early 80s my buddy Lenny, rest his soul, would travel to Canada to fish and would always return with a supply of Brador. It challenged my perceptions too, but in a good way, and I always enjoyed it. Thanks for dredging up some very old, pleasant memories, Gary, and Happy Boxing Day! Thanks Sam, and same wishes as well. Brador in the 70s and 80s was a good beer with a malty, distinctive taste. It was actually available in Ontario until about 5 years ago but the taste was different. One thing too you may find of interest. Even in the 70s-early 80s, word went around that Brador had changed from an “ale” (top-fermented) to something else, presumably a lager. This was before craft brewing took hold here, but still people who knew just that little more about beer than most would say this. I don’t know if in fact there was a change, for legal reasons the label stated (as the one I pictured) malt liquor. Maybe when that designation was introduced people thought the formulation had changed. Our beer composition laws were last revamped in the 80s so there could be something to that.